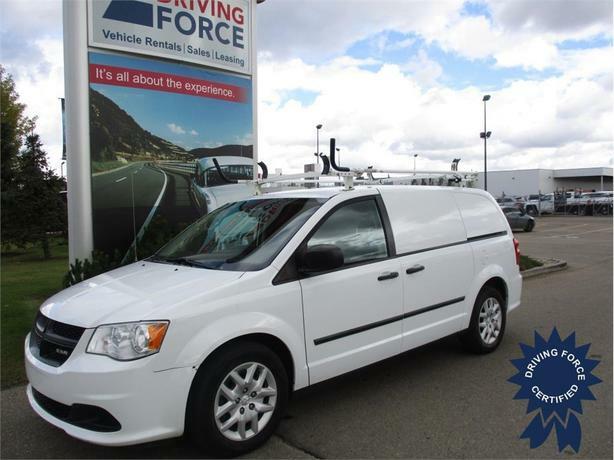 This 2014 Ram Cargo Van carries a very similar look to the Dodge Grand Caravan, but it is definitely a commercial hauler designed for small business owners. The high capacity interior in conjunction with the side anchor loops are a couple top features to note. Additional features include a 119-inch wheelbase, 6-speed automatic transmission, 17-inch steel wheels, cloth bucket seats, 3.16 axle ratio, block heater, 160-amp alternator, towing with trailer sway control, gas-pressurized shock absorbers, hydraulic power-assist steering, commercial wagon suspension, 76-litre fuel tank, light tinted glass, LED brakelights, three 12V DC power outlets, power windows, and roof rack. The 3.6-litre V6 gas engine provides 283 horsepower at 6,400 RPM and 260 lb-ft of torque at 4,400 RPM. All this vehicle needs is you and your corporate decal. It is ready to work. Touch base with us to discuss purchasing or financing options that are right for you and experience the difference you will only find at DRIVING FORCE Vehicle Rentals, Sales and Leasing.